Yirawala was among the group of artists who began painting at Minjilang (Croker Island) in the 1950s, with early works from this time being collected by Karel Kupka and distributed to a number of European institutions. In 1964 he met and began to work with Sandra Le Brun Holmes who was on Minjilang to record ceremonial songs and stories for the Australian Institute of Aboriginal and Torres Strait Islander Studies. Holmes was instrumental is promoting Yirawala’s work and their collaboration resulted in two books and two films promoting Yirawala’s life and art, in addition to a solo exhibition of Yirawala’s work at the University of Sydney in 1971, which then toured. 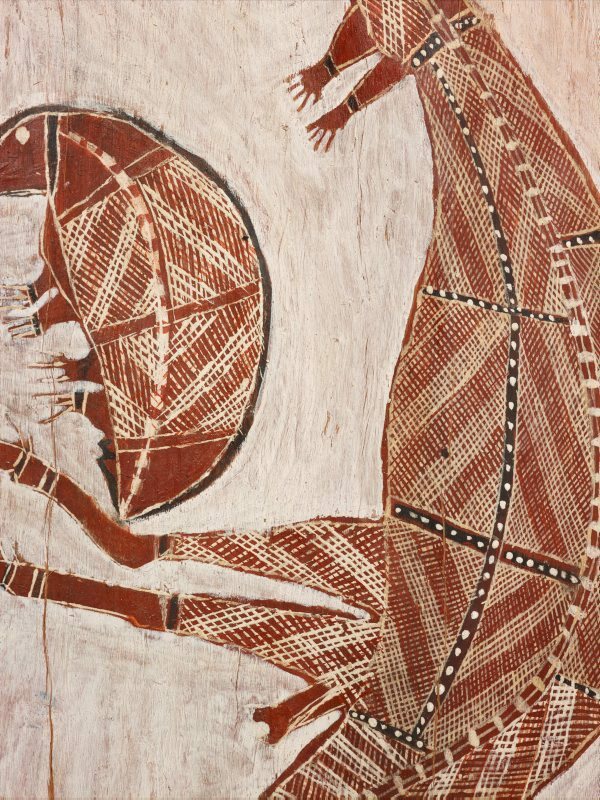 At this time Yirawala was awarded an MBE for services to Aboriginal art. 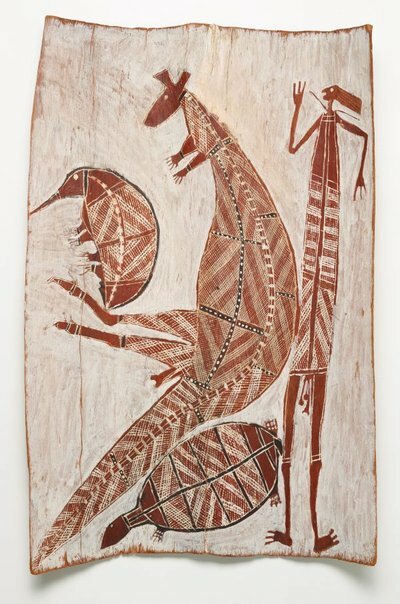 In his later years he lived at Marrkolidjban, working alongside Peter Marralwanga, and producing series of bark paintings that are now held by the National Gallery of Australia. 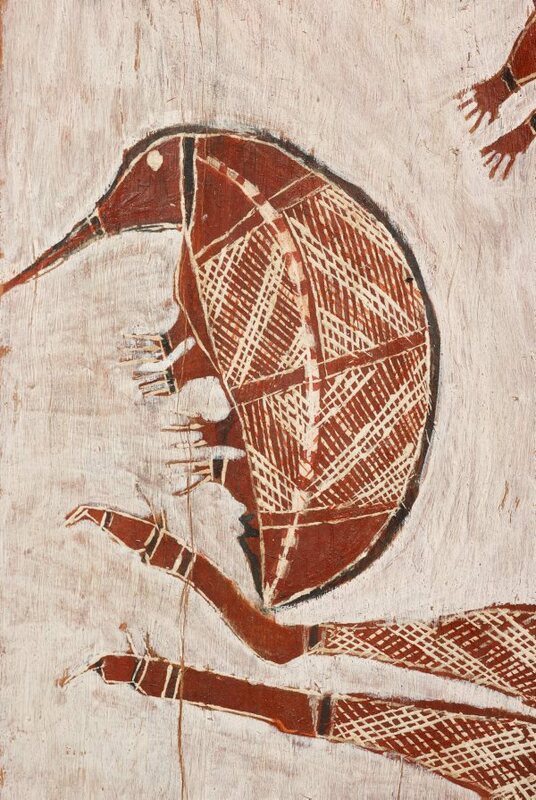 This is a classic examples of Yirawala’s work with finely detailed figurative elements floating on a plain, textural ground. Most interesting is the placement of the hatched infill within the figures which aligns to create diamonds or rectangles within the forms of the animals. This is most evident on the body of the kangaroo and juxtaposed with other areas of its anatomy that present a more linear approach within each segmentation. This division with the animals is both an artistic device to allow the shimmer of the hatching to be achieved and a culturally specific approach that reflects the connection of parts of each animal to specific clan affiliations and particular areas of country. 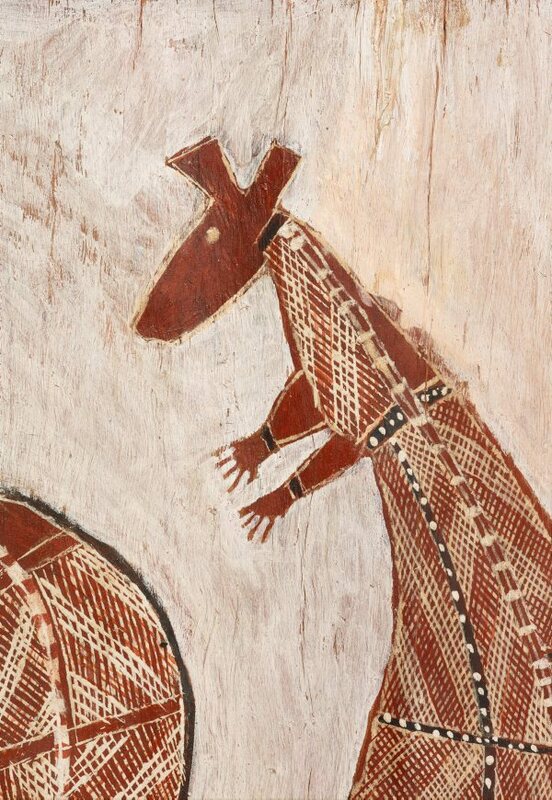 Overseeing the animals is one of Yirawala’s distinct figures, elongated and animate as if in mid conversation or movement, with fine adornment and characteristically protruding hair or headdress.